Recently revamped and refreshed, Mandalay B&B accommodation offers spacious en-suite, air-conditioned bedrooms, all with private entrances and comfortably equipped with a radio / alarm clock, a work space with a telephone and WIFI connectivity, a stocked bar-fridge as well as tea and coffee making facilities. Hair dryers are available on request from the office. In addition, Mandalay offers a laundry service at a nominal fee and delicious, home-made dinners are prepared on request. Each room has it’s own distinctive decor personality and all have been carefully and thoughtfully planned to ensure our Guests comfort, convenience and relaxation. All rooms have private entrances, air-conditioning, electronic safe , DSTV and a radio/ alarm clock. Rooms also have a work space with a telephone and WIFI connectivity, perfect for those working after-hours, a stocked bar-fridge as well as tea and coffee making facilities. Laundry facilities are available on request at additional charge. 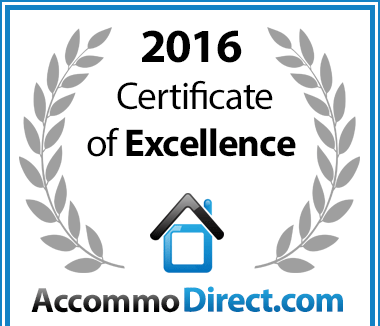 Mandalay B & B and Conference Centre in Durban North, Durban is hereby awarded a Certificate of Excellence, in recognition of exceptional service.